Rachael Wimberly – Tudor, Pickering, Holt & Co.
Rachael Wimberly serves as a Director in Corporate Finance. 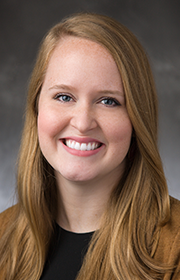 Wimberly previously served as an accounting advisory senior associate at KPMG and a postgraduate technical assistant at the FASB. Proctor holds both a BS and MS in Accountancy from Texas A&M University. Additionally, she is a Certified Public Accountant.